Dr. Tim Styles is originally from Kamloops, BC. He graduated from the University of Waterloo in 1989 and returned to BC thereafter. His optometry career has taken him to numerous locations in BC, including remote northern first nations communities. 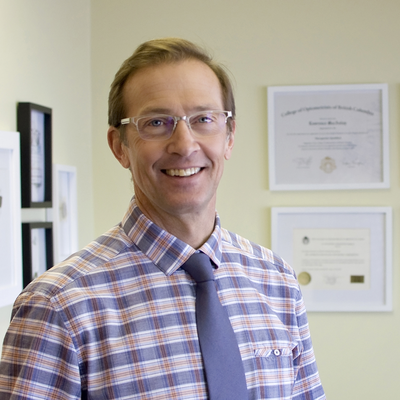 Having recently relocated to the North Okanagan from Golden, BC, Dr. Styles is excited to be working with the doctors and staff at Armstrong Optometry. He has a special interest in the management and treatment of dry eye conditions, and can provide BlephEx treatments to help those with blepharitis realize better eye health and comfort. He looks forward to building lasting relationships with his patients by providing compassionate and personalized eye care. Dr. Styles is an active member of the Association of Canadian Mountain Guides and has worked part time as a back country ski guide in the winter months over the past fifteen years. In his free time Dr. Styles enjoys cooking, and spending time outdoors skiing, cycling, running, hiking and fishing.